Note: This review comes from the Feb. 16th preview performance. Ninety minutes is not a lot of time to unpack the motivations behind racism, the challenges of balancing social responsibility with personal beliefs, and exploring personal growth and understanding. And though the Procunier Hall venue should serve as an ideal setting for such a study of intimate emotions, Cherry Docs suffers from a superficiality that’s magnified by acting, directorial, and set-related challenges. 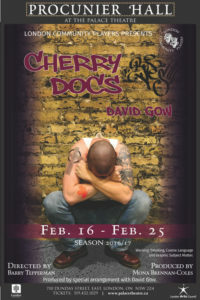 Cherry Docs is the story of Danny (Kyle Stewart), a liberal Jewish lawyer assigned to be the legal aid representation of skinhead Mike (Derek Barr) who has confessed to the murder of an Asian restaurant employee. The production centres around the interaction between the two as they deal with their individual demons and try to get to the core of what produced the environment for which the murder was the result. The script, itself, is strong. Unfortunately, its execution—in several ways—hampered the production. First off, volume substituted for emotion on a far too regular basis. Vocal tics and performance crutches served to distract the audience from the statements at hand. Stewart, in particular, relied too often on a vocal affectation that would see him raise his voice in anger, swallow his words, then whisper-talk the closure of the line. Used once or twice within a production, it can be effective and show true passion and highlight a moment where the emotion threatens to overwhelm the character. Used too often (and, during one scene, I counted 11 examples of this affectation in a five-minute piece of dialogue) it becomes distracting and steals attention away from the story. Overall, Stewart’s Danny is defined primarily by two elements: his religion and his one-note anger. He enters the play raging with little in the way of buildup. There was little in the way of character development throughout, which caused a disconnect during the play’s dénouement. A scene, clearly intended to elicit a feeling of pathos, fell flat—simply because the audience was given no reason to care. Barr’s Mike, who could easily fall into the trap of being a one-note reprehensible skinhead, actually showed solid range. Yes, there were moments of rage—some which threatened to tip over into self-parody—but overall there was a nice balance and sense of introspection and reflection. Sure, the conclusion seemed to wrap up a little too quickly and a little too neatly to be believable, but Barr’s performance allowed you to suspend that disbelief. The stage posed challenges of its own. It was set up in an “in-the-round” style, with seats along the east, south, and west walls. The south end of the stage was adorned with nothing more than a steel bench, intended to represent Mike’s prison cell; the middle of the stage featured a simple wooden table and a pair of chairs, the location for Mike and Danny’s interaction; and the north end of the stage had a white wicker chair and a kitchen/dining room table set up to stand as Danny’s home. Upon entry, 30 minutes before the show, the actors were already in place: Danny reading a magazine in his chair; Mike leaning forward, wringing his hands. The in-the-round setup should have allowed for greater intimacy with the crowd and more fluid motion. However, the sheer volume of items on the stage only served to limit the ability of the actors to move around. Raised stages and limited space meant that the actors could really only move from point A to point B, with very little use of the space in between. Lighting was also a challenge. Though the stark white light in Mike’s cell was effective, Danny’s home was dramatically underlit. This was exacerbated with the presence of an unnecessary video still along the north wall. The video image was used to mark the changing of scenes (and seasons, as well as tying into the seven-day religious theme), but it also served to completely obscure Danny’s face during a pair of soliloquies. Already emoting was at a premium and the backlighting caused by the video only served to eradicate any chance of seeing an emotion from Stewart’s face. As a story itself, Cherry Docs is well-written and is able to resonate with an audience—especially in light of today’s political climate. And Barr’s performance as Mike was effective and shows promise. But for a play that’s supposed to delve into the intimate nature of humanity, this production was too greatly hampered by superficiality and technical difficulties. I attended the same performance and learned the crew had a lighting cue freeze as soon as they started. They were unable to change lighting settings for the entire show. I guess if someone who lacks solid critical experience can review a play, it’s only fair that someone review the critic. Most reviewers or critics are aware of the impact of their words and are very careful before making assumptions – in print – about staging, lighting or even performances.. They are not there to be “cheerleaders” but they should be informed. This is not a writing gig one should toss off lightly. There is a responsibility involved, not unlike the one facing journalists to be “fair and balanced”. Personal opinion enters into it of course but the writer should always check themselves and ask “am I being fair?” Because sometimes, not saying that’s the case here, a critic’s ego takes over and they fall in love with their own prose. So when a reviewer has a huge issue with lighting or sound -it might be a good idea to check first to see if there is a technical problem causing the problem. If they’re not happy with the staging – they need to know what the script dictates. There are some playwrights who include very specific instructions about how their plays should be staged and what effects should be used. Video images considered “unnecessary”? One might want to check that out too. Having said that, I don’t think the audience we were with today, all of whom stood up to give this play a standing ovation at the end had a problem with any of that. This is an excellent production of a very interesting play that is highly relevant considering today’s political climate. It is riveting, intense and very moving. This is a play that should be seen and supported and kudos to the Palace Theatre for including it in its bill. The actors are superb. They inhabit the skins of the characters they play – a white supremacist skinhead and a Jewish lawyer in terrible torment as he defends a man who stands for everything he hates. And fears. It’s a play that will make you think and it’s one that shouldn’t be missed.